On An Overgrown Path: Why no excitement about Lou Harrison? 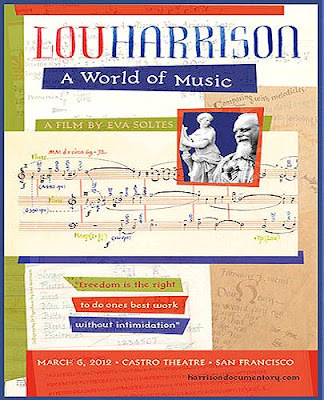 Why no excitement about Lou Harrison? Thank you for alerting us to the existence of this film. I had heard not a thing about it, and am very excited to attend a screening. Jorge Birrueta asks via Facebook "why no exciment abou Conlon Nancarrow also?? He was born 100 years ago". A fair point, although London's Southbank Centre is celebrating Nancarrow - see link 1 below. My interest in gamelan music and Lou Harrison was sparked many years ago by the Festival Hall gamelan - see link 2 below. 2013 is the tenth anniversary of Lou Harrison's death. Let us hope that the Southbank Centre and other venues around the world celebrate the anniversary in appropriate fashion.